I rented this because of Debbie Gibson and to see just how cheesy it might be. Good on Debbie--sorry, Deborah--for a movie lead. Bad on Deborah for a bad movie. Mega Shark is top-grade bad. Bad story, bad dialogue, and lots of bad acting. Not to mention a forced romantic sub-plot that falls on its face and makes rude bodily noises. Worse than an Uwe Boll flick. I thought Bloodrayne and House of the Dead was bad. Hell, I thought the non-Uwe Boll Dragon Wars was pretty bad. Mega Shark takes the cake. Mega Shark nabs a 747 in mid-air. Deborah punches out a sub officer. Half Moon Bay does not have palm trees, a lifeguard shack, or a pier. San Francisco International Airport's terminal is not green and does not have palm trees in the background. Treasure Island has nothing resembling the structure they depict. Their San Francisco Bay has nothing remotely resembling landmarks you'd see if you were actually in San Francisco Bay (e.g. Alcatraz, the Marin headlands, either Golden Gate or Bay Bridge, etc). 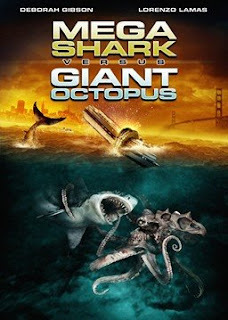 And for a movie that touts giant critter fights and assorted mayhem resulting from such, there's a severe lack of either. C'mon Asylum. I'd bet you had a shooting budget comparable to one episode of an hourlong TV show. Yet even the worst episodic looks far better than your movie. Hell--even NCIS was able to feature a more realistic submarine interior in a first season episode ("Sub Rosa") than your sad excuse. Rent it/Netflix it if you want a groaner for the evening. Otherwise, I'd encourage you to pass and watch a classic Godzilla movie instead. It may have been a guy in a rubber suit stomping on a model city but at least they did it right. And Deborah--please please pick a better movie next time. You did so well with your choices on Broadway. You can do the same here, too.